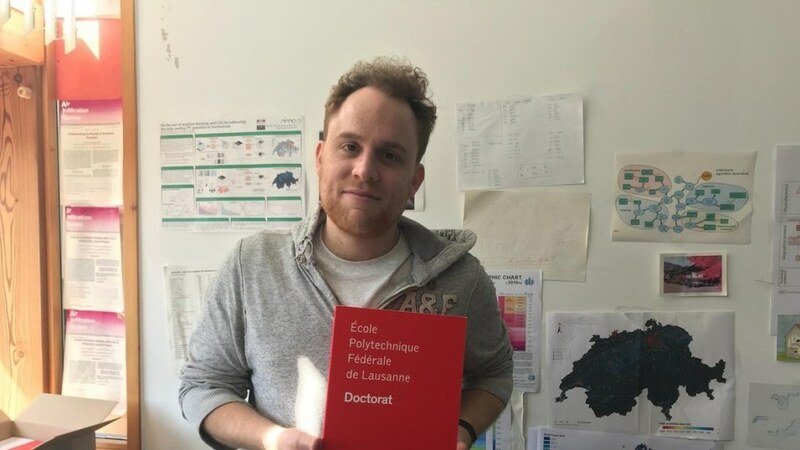 Dan Assouline has received a doctorate for his thesis “Machine Learning and Geographic Information Systems for large-scale mapping of renewable energy potential” written at the EPFL Solar Energy and Building Physics Lab guided by Dr Nahid Mohajeri and Prof. Jean-Louis Scartezzini. On the basis of machine learning techniques and GIS, his mapping of the Swiss renewable energy potential for various technologies offers important information for the description of local energy approaches as well as techniques that are applicable in different parts of the world. Moreover, his studies propose that the energy requirements of Switzerland can be efficiently fulfilled only with renewables. In order to optimize the use of renewable energy, the evaluation of their potential supply is required together with the demand loads in regions of interest. Particularly, large-scale supply estimation studies are required to assess regions of high potential for each type of energy source for a specific region and enable the expansion of efficient global energy plans. The “Energy Strategy 2050”, started in Switzerland in 2011 by the Swiss Federal Council, sets an example with the determined objective of achieving a 50%–80% decrease in CO2 emissions by the year 2050, with an apparent course of action: eliminating nuclear power, enhancing energy efficiency, and significantly improving the use of renewables. This thesis creates a general data-driven approach integrating Geographic Information Systems and Machine Learning techniques to map the large-scale energy potential for three very prevalent sources of decentralized energy systems: geothermal energy (using very shallow ground source heat pumps), wind energy (using horizontal axis wind turbines), and solar energy (using photovoltaic solar panels above rooftops). For each of the three considered energy sources, a tailored approach is proposed to evaluate its large-scale potential, by calculating multiple variables of interest with a suitable time resolution, using extensively available data, and combining these variables into potential values. The use of Machine Learning algorithms (notably Support Vector Machines and Random Forests) enables the prediction of the variables at unknown regions, along with the ambiguity linked to the predictions. In each case, the developed approach is established with an objective to be implemented for Switzerland, indicating that it is dependent on Swiss available energy-related data. Such data, however, including topographic, meteorological, ground/soil-related, and building-related data, are becoming increasingly accessible for most countries, enabling the proposed methodologies to be extensively generalized. Outcomes demonstrate that Machine Learning is sufficient for energy potential estimation since the multiple required predictions and spatial extrapolations are obtained with moderate accuracy. Final values validated with other current studies or data exhibit general agreement. For Switzerland, the outcomes indicate considerable potential for the considered renewables. Particularly, there is a comparatively high potential for Rooftop-Mounted solar PV panels because it is projected that they could give rise to a total electricity production of 16.3 TWh annually, which represents 25.3% of the annual electricity demand in 2017. This work was funded by the Swiss Innovation Agency Innosuisse through the Swiss Competence Center for Energy Research “Future Energy Efficient Buildings and Districts” (SCCER FEEB&D).